One particular bit of folklore that is still especially relevant today is that of fairy rings, also called fairy circles, elf rings, or elf circles. In Welsh they may be known as cylch y Tylwyth Teg [literally 'circle of the Fair Family']. The concept of these rings can be found throughout the different Celtic language speaking countries as well as the various diaspora and some Anglo-Saxon and German lore as well. Fairy rings appear as either a dark circle of grass or as mushrooms growing together in a ring, and less often as a circle of dead grass or small stones. It is said in folklore and common belief that this ring marks a place where the fairies have danced or where they like to dance. In the 12th century there was an English belief which attributed rings of daisies to elves dancing (Hall, 2007). The fairies love of dancing is well known as is their penchant to take people who disturb their revelry, either as a punishment or through a desire to keep the person in Fairy (Evans-Wentz, 1911). Fairy rings can appear in different sizes, from three feet across to ten times that size (Bennett, 1991; Gwyndaf, 1991). If they were the sort made of darker green within a field then they would be either moss or much darker green grass and were notable because "no rushes or anything grew on it" (Gwyndaf, 1991). From a scientific perspective fairy rings are created by the fungus mycelium and when they grow above ground can include a variety of mushroom species, both poisonous and edible. Even the dark grass circles or less common dead grass rings are the result of mycelium though, as the fungus naturally grows upwards and outwards in an expanding circle and effects the nutrient content of the soil, resulting in the visible fairy ring effect (Mushroom Appreciation, 2016). The scientific explanation doesn't necessarily contradict the fairylore explanation, and the two beliefs are compatible with each other. For example, in some folklore it isn't the fairies dancing that causes the circle but rather the existence of the circle that draws the fairies to dance there (Bennett, 2001). A person who comes upon an active fairy ring might see the dancers within it, and even the instruments, but hear nothing from outside, although in other stories hearing the music acts as a lure to draw an unsuspecting mortal in. Most people had a clear aversion to the idea of entering a fairy ring as it was known that to do so risked the fairies coming and taking the person away. In one Welsh story preserved in the late 20th century a person was questioned about why they avoided fairy rings and they relayed the tale of a boy named Robin Jones who entered a fairy circle one evening; he saw the fairies dancing and after what seemed to him a few hours in their company he asked to leave only to return home to find that a hundred years had passed (Gwyndaf, 1991). In a similar tale a man stopped outside a fairy ring, just to watch the fairies dance within for a few hours, and lost fifteen years of time for his dallying (Gwyndaf, 1991). Often the person would dance for what seemed like a night to them, or even only a few minutes, and then be allowed to leave only to find that a year or more had passed. Some fairy rings appear to have been used as a sort of trap to intentionally lure mortals, especially children, that the Fey folk wished to take and these people if they entered the ring would never be returned (Evans-Wentz, 1911). Other times however it seems to be only chance that leads a person to find fairies dancing in a ring; in accounts from Brittany some who join them are treated well and released unharmed with little time passed while those who offend them while they dance are forced to join the circle until they collapse form exhaustion or worse (Evans-Wentz, 1911). Once in a fairy ring, by choice or by compulsion, a person could not leave unless they were freed by the Good Folk or rescued by another human being. In one Scottish tale a man fell asleep in the middle of a fairy ring and woke to find himself being carried through the air by the angry fairies who dumped him in a city many miles away (Briggs, 1978). In the above example of Robin Jones the boy was allowed to leave when he asked politely to, although upon leaving he found that so much time had passed on earth that everyone he knew in life had died. In another story a boy was taken through a fairy ring and tried to leave later with a golden ball to show his mother; the fairies took the ball back and threw the boy out after pinching him until he was thoroughly bruised (Evans-Wentz, 1911). He re-emerged and returned home to his mother to find that several years had passed. Several options were available for those seeking to rescue a comrade from a fairy ring. One Welsh method of securing a person's release was to place a stick of rowan across the boundary of the ring, breaking it (Gwyndaf, 1991). Some suggest throwing specific herbs, including thyme, into the circle, and of course iron is seen as superlative method of both disrupting a fairy ring and protecting oneself from angry Fey (Hartland, 1891). Any iron object would suffice and could be used to break the edge of the ring or could be tossed into the circle to disrupt the dancing. Another method was for someone safely outside the circle to reach in, sometimes by stepping on the perimeter of the ring, and grab the person as they danced past (Briggs, 1978). Even if they were rescued though many times the person could not truly be saved, and those who had danced with the fairies in a fairy ring were known to pine away afterwards or else, if they had been taken for a length of time and allowed to leave they might rapidly age or turn to dust when the truth of their long absence from mortal earth was revealed to them in their home place, then occupied by strangers (Brigg, 1978). There is a strong belief that if one finds a fairy ring it should not be disturbed, not only because of the possible danger, but because there is a sacredness to the space set aside within them. If one were to damage a mushroom associated with a fairy ring reparations would be offered to avoid punishment (Bennett, 1991). In Scotland and Wales it was generally unthinkable by those who believed in the Good Folk to consider intentionally damaging the ring or mushrooms, and it was believed that those who did so would be cursed (Bennett, 1991; Gwyndaf, 1991). In one Irish story a farmer who knowingly built a barn on a fairy ring fell unconscious afterwards and had a vision telling him to take down the barn (Wilde, 1888). 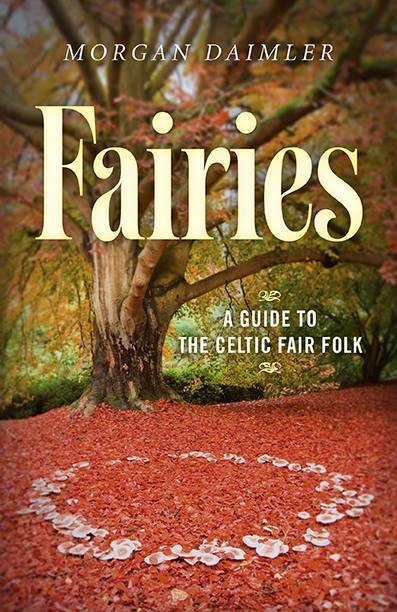 Fairy rings are still found today although perhaps fewer people see the footsteps of the Fey in them, and more see the science of mycelium. In the spirit of tradition though it doesn't have to be one or the other but can both, in truth, and we can still see the enchantment and sacredness of the footsteps of the Good People in fairy rings without denying the knowledge of their natural cause. If you keep your eyes open and your sense sharp you may find a ring of dark grass or new grown mushrooms in your yard or the area you live in. Although perhaps you'll think twice about stepping across its boundary.